Convert DVD to video and audio for iPod Touch and iPod Nano. 1.A professional DVD to iPod converter for Macintosh OS. 2.Convert DVD to MP4 iPod video. 3.Extract and rip DVD audio to iPod with the original sound quality. 4.Allow you to select DVD titles and chapters to convert. 5.Trim a DVD title or chapter to capture a clip from your DVD movie. 6.Select the DVD subtitle you prefer to convert your DVD movie. 7.Provide you with various video and audio settings such as video resolution, video frame rate, video bit rate, audio bit rate, audio sample rate and so on. 8.Let you merge the selected chapters and titles into a single file after conversion. 9.A progress bar to show you the elapsed time and remaining time of the conversion process. 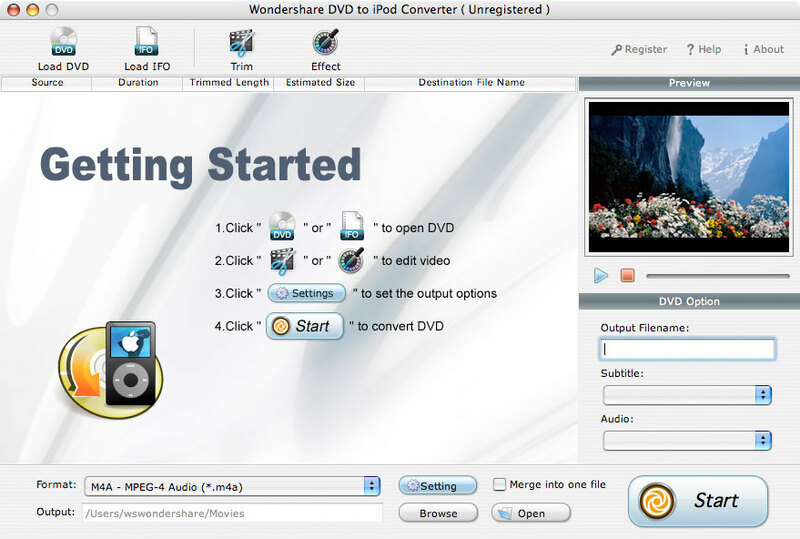 Qweas is providing links to Wondershare DVD to iPod Converter for Mac 1.8.2.2 as a courtesy, and makes no representations regarding Wondershare DVD to iPod Converter for Mac or any other applications or any information related thereto. Any questions, complaints or claims regarding this application Wondershare DVD to iPod Converter for Mac 1.8.2.2 must be directed to the appropriate software vendor. You may click the publisher link of Wondershare DVD to iPod Converter for Mac on the top of this page to get more details about the vendor.